OCLC is rolling out a new ILS to public libraries in the U.S.—just don’t call it an ILS. The company describes OCLC Wise as a community engagement system—it’s like an ILS, but one that is built around the customer experience. Wise handles traditional functions (such as circulation, cataloging, and discovery), but differentiates itself with integrated tools for marketing, customer relationship management (CRM), event registration, and collection analysis. The Wise system, while new to the U.S., is not entirely new. Developed by the Dutch library automation company HKA (which OCLC acquired in 2013), Wise is currently used by 80% of libraries in the Netherlands and is being adopted by libraries in Belgium and Germany. OCLC has been conducting advisory sessions and beta testing with public libraries in the U.S. for the past few years. Why is 2019 the right time to bring Wise to the U.S.? According to Scott Livingston, OCLC’s executive director of management services, there has been “a notable shift in the types of activities American Public Libraries are engaging in and the types of tools they are desiring to further their missions.” Specifically, public libraries today are as much about people as they are about collections, serving as busy community centers. Wise seeks to adapt to this shift with a system that offers tools for engaging patrons, promoting events, managing meetings, and tailoring collections. For patrons accustomed to the modern ecommerce experience, there is a growing expectation of personalized services. Wise seeks to get personal by leveraging the patron’s demographics data, circulation history, and event attendance to tailor services, messages, and collections based on actual patron behaviors. By having a system that’s designed around the user profile, Wise operates like a CRM system, providing tools to analyze customer interactions with the goal of improving retention and engagement. According to OCLC product manager Ty Pierce, Wise is “designed around people and driven by data,” with nearly every function and feature of the system built to “provide as seamless an experience for the customers as possible.” And when OCLC says its system is patron-centric, it means that literally. With Wise, OCLC dethrones the bibliographic record as the long-standing mainspring of the ILS and elevates the patron record to top dog. Whenever a patron interfaces with the system (by checking out a book, attending an event, opening a newsletter, etc. ), it records that data to the patron record to build a profile. This change presents some interesting opportunities for public libraries to leverage data to gain insights into their patrons and make predictive decisions about collections and programming with a system that provides the benefit of relying on observed behavior instead of assumption. One of the more innovative features of the Wise system is its integrated email marketing tool. Most libraries have an email marketing platform, and using it typically involves exporting a big list of email addresses from the ILS to a third-party platform for monthly newsletter blasts. But with Wise, libraries can use patron behavior data to target their communications and deliver highly relevant messages to their most interested patrons. Libraries seeking to promote an event or service can use Wise to identify and reach the target audience for their communications. By leveraging stored data, marketing messages can be tailored to patrons based on their expressed interests and circulation history. Automated emails can be set up to engage patrons around pre-designated parameters such as birthdays or before a card is set to expire. As an example, a library hosting an event might want to target readers of science fiction. The library could use Wise to generate a mailing list of everyone who had recently checked out relevant materials, and it could further refine that list by adding or removing categories. If the event is only for adults, the library could exclude patrons younger than 18. If the event features a particular author, the library could further target messages around author or title data. Once the list is compiled, the library could use Wise’s integrated messaging platform to deliver a targeted marketing message that would appeal to a high-interest group of patrons. Patrons would encounter fewer uninteresting, irrelevant, or overly general messages from the library and instead find messages that account for their tastes and behavior. A library using Wise can maintain its current website or opt for a more cohesive interface that fully integrates the discovery interface with a Joomla-based website. Library patrons generally don’t distinguish among a library’s website, catalog, calendar, or mailing service; the ability to integrate these various functions means they won’t need to. The integrated system is capable of managing all aspects of a library’s web presentation to deliver a more seamless user experience. For patrons, the transition from catalog to website and back becomes easier, as they are not jumped to different systems or domains. The Wise discovery interface includes a catalog search that integrates with third-party content providers such as OverDrive and hoopla. 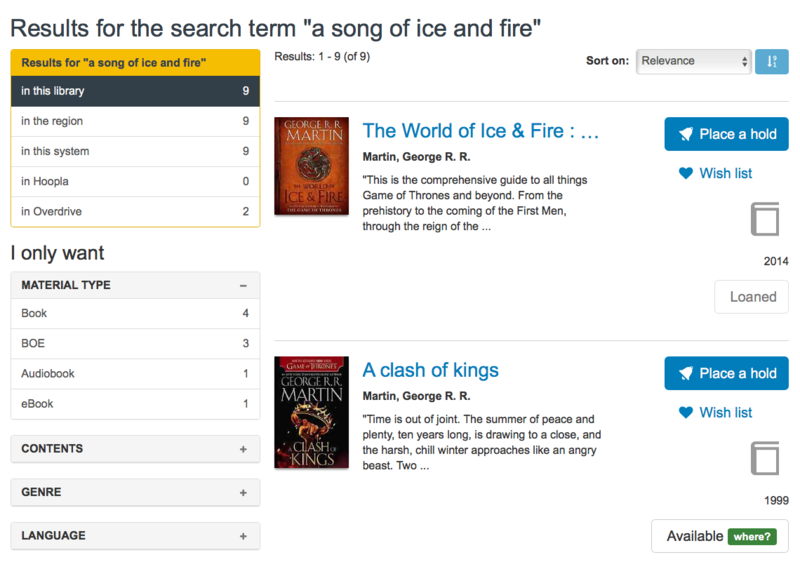 The search bar features predictive input technology that suggests results based on the library’s holdings, and the results page features facets for limiting results. A library can control its web presentation though a portal that provides tools for promoting collections and events. Book jacket images are included with Wise, eliminating the need for another third-party integration and enabling the library to make carousels of featured materials. The Wise discovery system also serves as a social engagement connection point, presenting opportunities for patrons to view and create user-generated content such as reviews, ratings, recommendations, and wish lists. 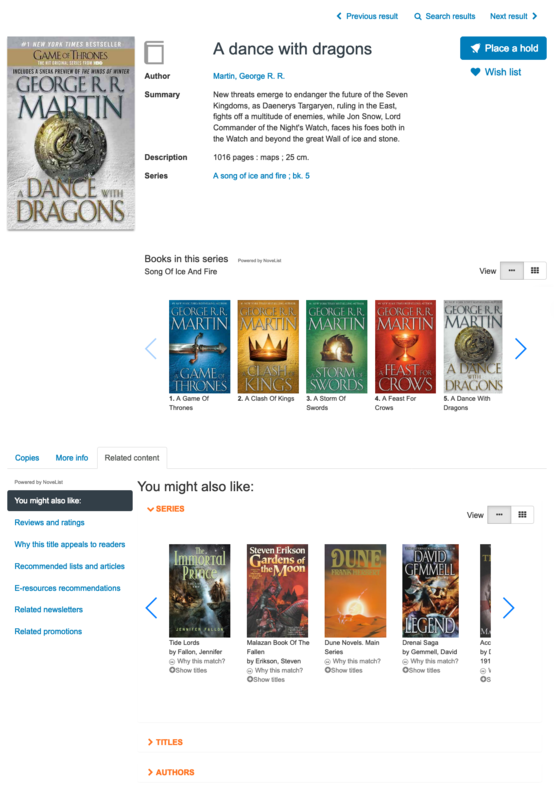 Integrations with social media platforms allow library patrons to take that same content out of the catalog. Livingston says that with Wise, “I can post a title I’m reading to Facebook or Twitter and invite friends to comment and [dialogue] around it. It’s a very 21st century, social, e-commerce type of experience.” By leveraging user-generated content, Wise is able present an item display that is familiar to internet users who are accustomed to using ratings and reviews to inform their selections. The “designed around people and driven by data” ethic also extends to the system’s collection development functions, which rely on patron data to deliver a customer-driven collection development solution. Unlike library-collection analysis tools that require data to be exported to a third-party service, OCLC’s tools are integrated, automated, and real-time. The library can set thresholds in Wise, and the system will deliver purchasing recommendations, weeding lists, or floating collection moves in real time. The result is a balanced collection that adapts to the community’s changing reading habits. Working with parameters set by the library, Wise analyzes how materials are being used within a library system, within a branch, and down to the shelf level to make recommendations about appropriate balances for collections. This enables the library to rely on data instead of assumptions, as the system makes acquisition and balancing recommendations based on real-time transaction history. Businesses and organizations are hungry for data, and the most successful players are those with the most access. In today’s data-hungry world, Wise’s “driven by data” philosophy feels like a logical evolution for the ILS, which has historically offered limited tools for mining, retaining, or leveraging data. “Driven by data” appears, at first glance, to stand in contrast with ALA’s stated commitment to an ethic of facilitating access to but not monitoring information. But Livingston stresses that the Wise system was developed in Europe, and “as concerned as American libraries are about protecting patron privacy, European libraries, because of the history of Western Europe over the past hundred years, are even more sensitive.” According to OCLC, the security protocols built into Wise reflect that heightened European sensitivity about government observation, intrusion, and civil liberties while adhering to the European Union’s strict legal standards around data privacy and protection. Many Western European libraries are not government-funded and therefore need to work hard to attract and retain subscribers. These dual pressures of wanting to both leverage and protect data led to the development of a system that maintains but masks patron data. Circulation retention records are set by the library based on its policies, and librarians who are using the system to target messages can only see masked patron counts, not the records for the individual patrons matching those numbers. The emails are sent out programmatically, so the librarian can track the marketing campaign without seeing the names or borrowing histories of the target patrons. As a technology, the ILS has not done a very good job of adapting to the changing needs of modern public libraries, forcing them to seek add-on services to supplement or enhance their ILS functions and OPAC presentations. Third-party services such as BiblioCommons, collectionHQ, and ChiliFresh exist to prop up the ILS; they are like a wish list of features that public libraries want their ILS to have. Wise is OCLC’s response to the strong market demand for additional services to supplement the ILS and enhance the library’s digital presence. With a holistic and patron-centric design philosophy, these additional services feel more like an integrated whole. OCLC is known for connecting libraries around the world with bibliographic-oriented systems such as WorldShare and WorldCat. For OCLC to roll out a system that is both patron-oriented and highly localized is remarkable, and it speaks to a growing divide in the services provided by public and academic libraries. As the needs of these institutions diverge, the one-size-fits-all ILS cannot accommodate all types of libraries. Libraries want a system that will handle all of their processes, but increased specialization is required as those processes change and grow apart. By delivering an ILS made specifically for public libraries—addressing their changing needs—OCLC will hopefully shake up the stagnant ILS market and spur competitors to develop more specialized features. Screenshots are courtesy of OCLC. Ben Johnson is the adult services manager at the Council Bluffs Public Library in Iowa.